Most of us enjoy helping other people. We like to feel useful and we feel like better people when we do things for others. The act of helping also brings us together, often creating a sense of community. This week, then, we look at the words and phrases that we use to refer to actions that we do to help others. Perhaps not surprisingly, the noun hand, meaning ‘help’ is used in a number of common conversational phrases. It is often – although not always – used for physical rather than mental tasks. Could you give/lend me a hand with this table, please? / Ethan might need a hand with the clearing up. A near synonym of ‘help’ that has similar words in Romance languages is aid. The main sense of the noun ‘aid’ is quite specific. It means ‘help in the form of money, food, etc. given to a country that needs it, for example, because of war, drought, etc.’: Its collocations are words such as humanitarian/emergency/overseas: He argues that we should increase overseas aid. The noun aid also means ‘help’ in a more general sense, but mainly within particular phrases. If you come/go/rush, etc. to someone’s aid, you go to them in order to help them: She went to the aid of a man trapped in a car./ A woman in the street saw that he was in trouble and came to his aid. An aid (countable) is a piece of equipment that helps you to do something: teaching aids such as books and videos. The verb aid is slightly formal. A gadget or project might be said to aid a particular thing, meaning that it helps that thing to happen: a device designed to aid weight loss. The same verb is also heard in the legal term aid and abet, meaning ‘to help someone to do something illegal’: He was charged with aiding and abetting assault with a deadly weapon. Assistance, another noun meaning ‘help’, is also often used in fixed phrases. Someone might ask, slightly formally, if they can be of (any) assistance, meaning ‘can they help’: Let me know if I can be of any assistance with the preparations. If you come to someone’s assistance, you go to them in order to help them: Eventually, a police officer came to my assistance. The verb assist is mainly used in official or formal contexts: The army were brought in to assist in the search. As you might expect, we sometimes express the idea of helping each other by using phrasal verbs. 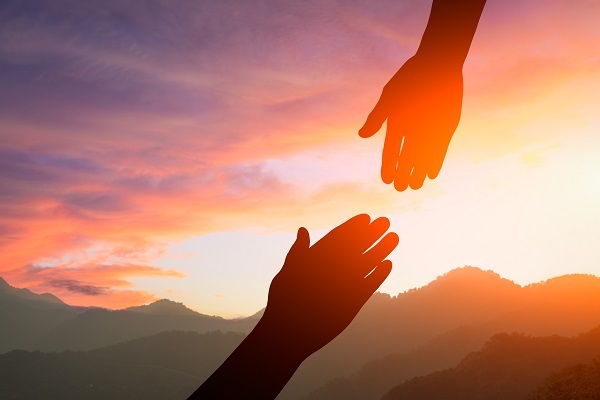 Help out is a very common phrasal verb, meaning ‘to help by doing a part of someone’s work or by giving them money’: Thanks for helping me out with that report – you saved my life! Pitch in and UK muck in both mean ‘to help, as a part of a group’: There was a lot of cleaning to be done, but we all pitched in. Meanwhile, to bend over backwards is to try extremely hard to be helpful, (often when this is not appreciated): We bent over backwards to help her. She never once thanked us. Finally, we end this piece with a very common phrase heard in conversation. To make yourself useful is to do something to help: I thought I’d make myself useful by getting cups of coffee for everyone. Good morning miss! Oh yes, I know the expression and we also use it with the same sense in spanish. It is very useful abd expressive! Thanks! To me it always meant to go above and beyond the normal, to bend over backwards. Price increased to a particular number, let say 10 or 20 dollars but price increased by particular percentage, an example movie ticket price increased by 10% . It all depends on the context in which you’re using, and what next follows the phrases. But I think, it much more proper if you use ” it increased by 20% at cost price. You can also say it increased to £200 due to the hard times we’ve found ourselves. I hope this would be useful. Both are correct. The price of mangoes increased to 50 rupees a kilogram. Earlier it was 45 rupees a kilogram. So, the price has increased by 5 rupees.